Machinery validation or Qualification is a mandatory requirement when ever a machine is used in a way that can affect the quality, safety, efficacy of a controlled product or jeopardize the integrity of any predicated data, relating to that product. The term machinery relates to any metal moving or removing equipment which is largely mechanical in operation, but may have software management or recording facilities. Examples; could be metal working machinery such as CNC - machining-centers - milling - turning - drilling - packaging machinery. In the US this is managed by the FDA. In Europe it is managed by EU. Many other countries also have an agency to manage this requirement and those that don’t usually rely on the World Health Organization (WHO). Machinery Validation and or qualification requires a suite of inter-related documents to be put into place. Each document should be constructed to a format and with a content that will satisfy the regulatory expectation for such a document. The regulations leave a certain amount of freedom to manipulate tests and inspections to save unnecessary retesting and ease access and downtime requirements. However this freedom does not affect the basic directives; which mandates, the documented need for the suite of documents to start at the VP then the URS and on through the VRA, DQ, IQ, OQ to the PQ. These regulatory requirements exists and must be complied with. CLICK HERE TO VIEW MACHINERY VALIDATION TEMPLATE DOCUMENTS. Machinery Validation Practices and Procedures. The procurement process normally starts with the production of a documented requirement or group of requirements. For existing facilities this should take the form of a Change Request (CR). As soon as management has agreed to proceed with the CR, approval should be issued to produce a Validation Plan; sometimes called Quality Audit Plan (VP). This plan must be all encompassing. It must give assurance that all aspects of the proposed CR have been studied and the CR impact on existing facilities, utilities, product and personnel have been defined and the appropriate corrective or support actions planned for. A fully detailed User Requirements Specification (URS) can now be authored reviewed and published. Since developing the URS may raise problems that could not be anticipated when the VP was raised; a VP review is required to ensure all aspects of the final approved URS are fully catered for. 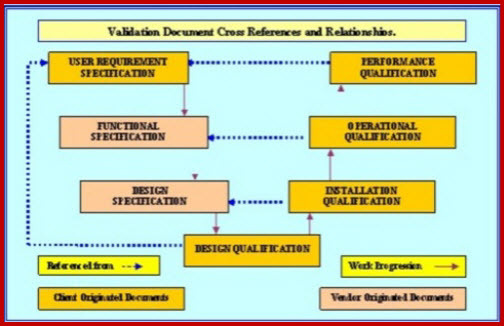 With the URS defined and the Validation Plan (VP) in development Validation Risk Assessment (VRA) must be authored and executed to establish the scope and depth of CNC validation that is appropriate for this equipment. This information must be published in the VP and used as the authority for all protocol development. Where vendor developed Functional Specifications FS) and or Design Specification (DS), are available they should be reviewed and referenced in the VP. Where these documents are not available a DS or FS may have to be retrospectively developed. The installation of each validatable item and or system must be subjected to, and satisfy, an approved Installation Qualification (IQ) protocol. Details of the scope of the IQ, responsibilities for generating, reviewing and approving of this document must all be documented in the VP. When the requirements of the IQ have been satisfied, all aspects of the operational capabilities of each system must be fully challenged and verified by the execution of a pre-approved Operational Qualification (OQ) protocol. As with the IQ; OQ scope and details of the persons responsible for generating, reviewing and approving of this document will be documented in the VP. As soon as the executed IQ and OQ protocols having been reviewed and approved, a pre-approved Performance Qualification (P1Q) protocol or Process Qualification P2Q) (this requirement will be documented in the VP) must be issued for execution.The execution of this PQ must verify that the system performance requirements, as specified in the URS have been achieved, and that the system operates in a manner safe to the product and production personnel.